Do you need to use a pressure washer to remove dirt, dust and debris from the siding or the deck? A pressure washing unit is not a toy and requires expert handling. Understand a few essential safety tips for handling the equipment so that you have a clean and accident-free home. Pressure washing is one of the best and quickest ways to remove dust, mud, dirt and fungus from hard-to-reach surface. 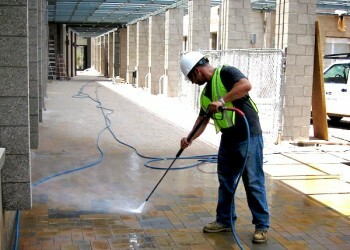 It is often used for cleaning decks, patios and several other exterior structures. However, unlike other equipment, a pressure washer requires utmost care as carelessness can cause damage to your home. Do not think that just because water is a major component in a pressure washer, it is okay to be lax about it. Pressure washer injuries are no joke. You cannot use it without wearing proper protective gear. Let’s understand how to use a pressure washer and ensure a safe home improvement project. Understand your purpose before buying or renting a pressure washer. If you buy one with high power, you may end up damaging the surface. If you are cleaning a deck, a pressure washer with 1200-1900 PSI (Pounds per Square Inch) and 1.5 GPM (Gallons per Minute) is sufficient. But, for a concrete driveway, you need a washer with 3000 PSI and 4 GPM. So, understand your needs, read the user manual and then make the purchase. Pressure washer injuries are quite common but they can be avoided if you wear protective equipment. It is essential to invest in safety equipment because there are high chances of the dirt and debris flying towards you. It means safety googles are non-negotiable. Also, you cannot operate the equipment wearing regular clothes. It is best to wear safety suit and gloves. Do not wear open-toed sandals while cleaning a surface with the washer. It is important to place the equipment on a flat surface. Do use extensions for reaching high places because the force of the washer can push you off the ladder. If you are using an electric washer, plug it in a GFCI outlet. And, if you are using gas-powered pressure washer, check the engine oil before turning it on. Do not make the mistake of refueling it if the engine is hot or running. Do not start the washer before connecting it with a water supply. Do not try to change the spray pattern while the spray nozzle is active. It is crucial that you grab the pipe steadily with both hands so that you can control it, in case the gun shudders. Sometimes, water may get trap inside the unit so, it is best to put the safety nozzle and lock the trigger after using the pressure washer. Be aware of hazards around you. Avoid using pressure washer near moving vehicles, kids and pets. Do not spray the pressure washer at some one. Water is released at high pressure from the equipment and it can cause serious damage to the person. Do not use a gas pressure washer in closed spaces because the fumes may cause breathing problems and dizziness. Stay away from electrical appliances, polls, and power lines while using the equipment. Do not store the unit straight away. Let it cool for a few minutes. Additionally, create a list of all the hazards that may affect you. It will allow you to think of solutions beforehand. Thus, preventing any accidents in the first place. Pressure washer is a great way of cleaning your home and making it ready for a quick painting job. But, you cannot ignore the safety tips and risk injuring yourself or others around you. The water released from pressure washer is enough to damage your skin and keep you in bed for a couple of days. So, follow the safety tips and ensure safe and efficient cleaning. Pressure washing is best left to experts. Avoid injuries and get ready for a clean home with efficient pressure washing services from Toronto home painters. Get in touch with Perfect Painter today; enjoy affordable exterior painting.